Just stopped by the Greenville Growler Station and picked up a growler of Ballast Point Brewing & Spirits' Victory At Sea Coffee Vanilla Imperial Porter, which should make waiting for Santa's appearance that much easier (pass the ice cream, wouldja!). That 10% abv will keep this lad's spirits bright!!! 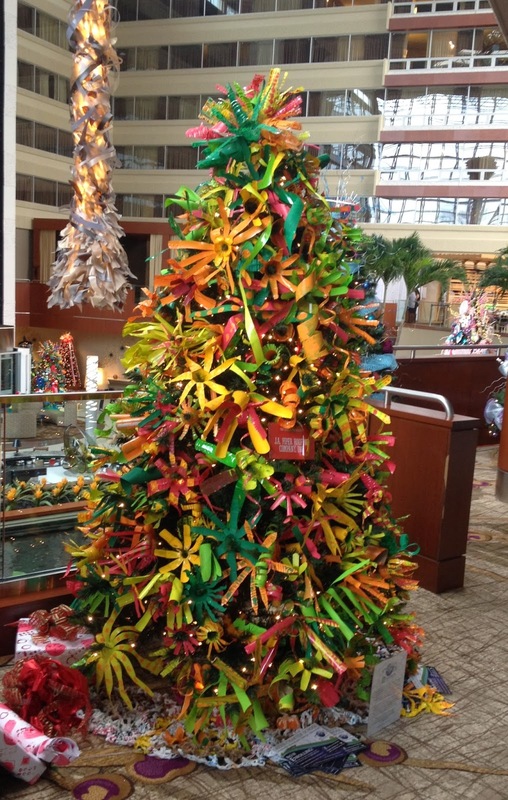 A tree so bright, it doesn't need lights! 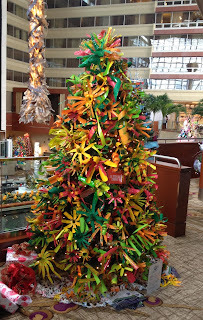 At the Greenville Hyatt Tree display. Merry Christmas to all and I hope we get to share a pint or two next New Year!! Traveling thru beautiful downtown Traver's Rest the other day gave me the opportunity to stop by the under-construction Swamp Rabbit Brewery to check on progress. While I was sticking my head in the door and watching the floor being sanded and smoothed, Ben Pierson walked up and we had the chance to talk briefly (he's understandably very busy). Ben was a bit bummed cause the floor is not yet done, but he is taking it in stride, dedicated to getting things done correctly the first time so that they won't come back to bite him on a certain anatomical feature later on. I wish him all the best for this project cause I am very excited about the future possibility of biking from HFB World Headquarters up to his facility for a well-earned pint or three. All the best to Ben and Cheers to y'all!! Anderson Valley Winter Solstice seasonal ale. 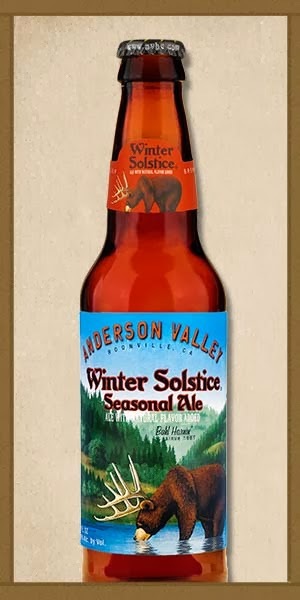 Paired nicely, the caramel and spice flavors added to the malty mouthfeel (Pale Two-Row, Crystal, and Munich malts were used), moderate use of hops kept the sweetness down and led to a creamy, lingering finish. It even tasted good with the pumpkin pie! I'll remember this for next year. 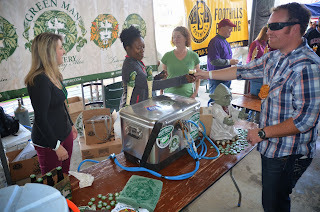 Paid my first visit to Highland Brewing in Asheville yesterday, along with Big Jon Richards from The Growler Station, to try their beers at the source and to talk with Leah Wong Ashburn, co-owner/VP for Highland. Their motto, over the doors to the Tap Room. Hey, where'd that truck come from??? I like their metal sign; sort of reflects their many years of brewing in Asheville (since 1994). probably better enjoyed in small doses." Anyway, he was gracious with his time (as was Leah; more about that later). St. Terese's Pale Ale, 5.1% abv; 24 ibu. Gaelic Ale, 5.6% abv; 30 ibu. Kashmir IPA, 6% abv; 60 ibu. Oatmeal Porter, 5.9% abv; 35 ibu. Black Mocha Stout, 5.9% abv; 35 ibu. Starting with their St. Terese's.. well balanced malt and hops, very drinkable. Cold Mountain Winter Ale, 5.2% abv; 28 ibu. Without reservation I declared this the best beer of the day. Almost tingly carbonation leads to medium body with delicious malt balance and a lasting, touch of vanilla, finish. Very drinkable and a strong candidate for my Thanksgiving table brew. It's a seasonal so I recommend you get it whenever you see it. Big Jon also raved about this beer. 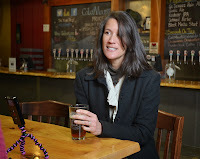 Next came the interview with Leah, topic of the day was women's role in this craft beer phenomenon. The topic was inspired by a New York Daily News article that informed it's readers (somewhat belatedly) that... wait for it... women like craft beer. And even more amazing (to the author, anyway), women are even becoming brewers! Well since it's a New York newspaper, it must be true but to make sure, I asked Leah (daughter of Oscar Wong, founder of Highland, and now Co-Owner and VP) for her reaction to the story. Her response was to smile knowingly and take a sip from her pint of Gaelic, her go-to Highland beer. HFB: What's your take on the women becoming more involved with the brewing story? LWA: "It's been such a guy industry for such a long time... to me, it helps balance out the industry. We've all got talents and skills." HFB: What about the sensitivity difference in men and women's palette and the ability to taste components differently? Do you have an example? LWA: "Sometimes I do describe things differently. 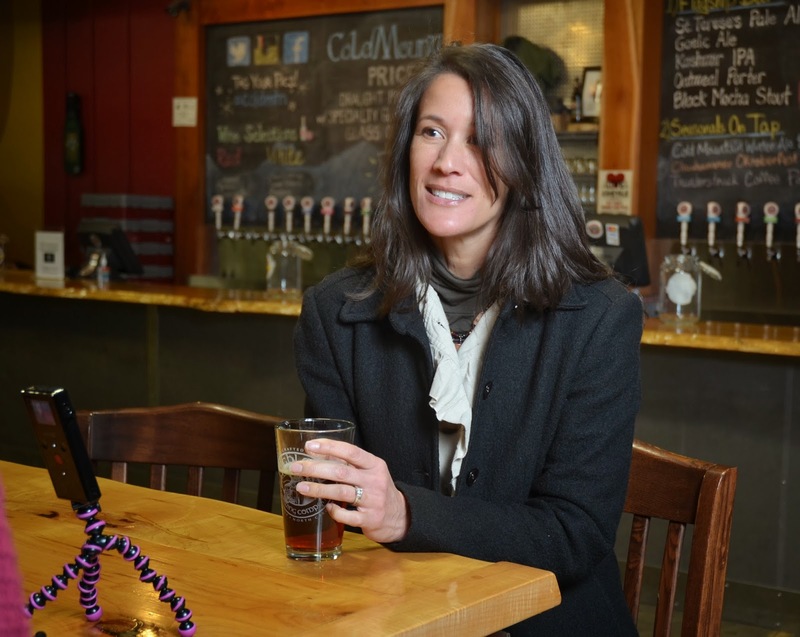 As you know, one of the descriptors for beer is cat pee [an off flavor called Mercaptan, caused by exposure to light] and that jumps out to me more than my husband or others on the staff." HFB: What are more ways that a woman might enter this industry? LWA: "One of the great things here locally is there's a new Brewing Science Program... AB Tech has one that's right here in Asheville and I believe it's Appalachian State, which isn't too far away, that has a program and their own brewery on campus, so that's really cool. But start meeting people in the industry because it's so family oriented and so social, that having connections to people, that's really the most important thing." HFB: For more women to become a larger percentage of craft beer drinkers, they first have to develop a taste for it. 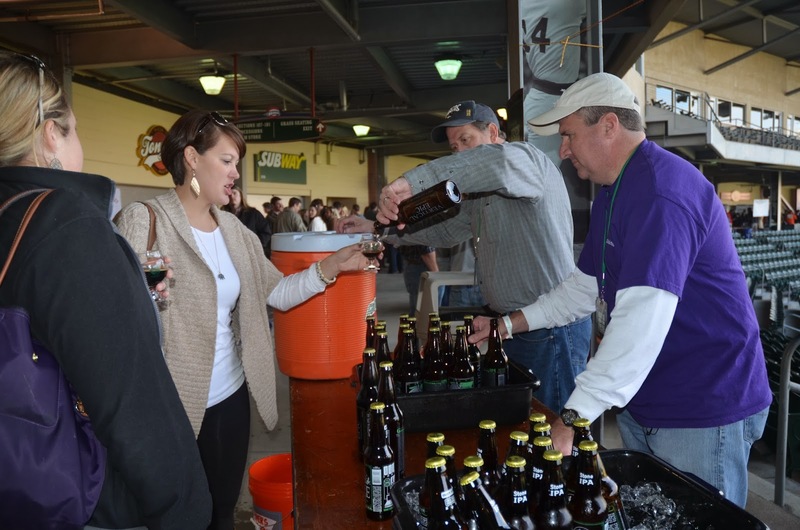 Do you have a method for getting first timers to try a craft brew? LWA: "...(when) I meet some women who maybe aren't quite into craft beer, I ask them if they drink red wine and if they say yes, I guide them towards this rich dark beer, like a mocha stout that we make. It's such a delicious beer and it's one you let warm up a little bit and you spend some time with it. So I talk to them about red wine: how do you drink a rich glass of red wine? It's a little bit warm, it's rich and you sip and you just kind of enjoy every bit of it, and slow down. And they say, ok, I get that. So then I give them a Black Mocha Stout and they love it!" With the name Highland, you just know that their mascot is a Scotty. This character is a vital force in the packaging department. 6 bbl pilot system for experimenting with new recipes. Using a vacuum hose to wrangle the kegs is a back and life saver! Big Jon and Will calling it a day. I'll definitely return to Highland, especially next year when the outdoor music concerts start again. Of course, events are happening there frequently and they do have a large indoor stage conveniently located right near the bar. Which is probably where you would find me. Again, my thanks to Leah and Will for being so gracious with their time.